The arrival of the Tech Age and the increased inter-connectivity of the world resulted in people having to keep up with more contacts. It is already common for people to have as much as 300 contacts on their Android devices. Having these many contacts can be confusing. Your personal connections could get mixed with your business contacts. It is important for you to make an effort to make your contacts list manageable. And please remember to backup Android contacts from time to time in case of contact data loss, otherwise you will have to recover deleted contacts from Android with Android Data Recovery software. This is why you should download some best free contacts management apps for your Android smartphone. With them, you will be able to effectively manage your contacts so that everything will be organized. 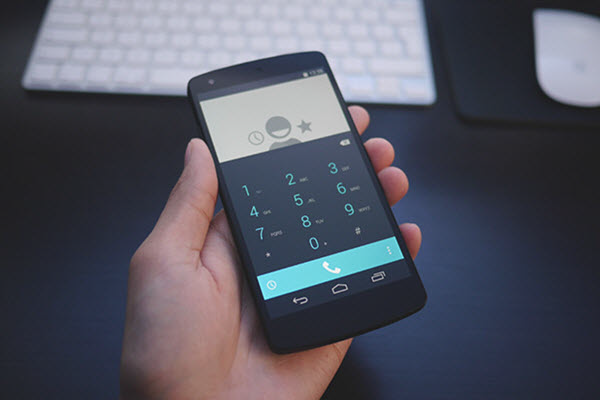 In this article, we will introduce you ten of the best dialer apps for Android devices. If you are the type of smartphone user who place a lot of value on security, Smarts Contacts Manager would be perfect for you. This particular contacts app provides an option for users to do backups of the contact details. It also allows users to set up a password to access the contacts, making it difficult to see contact details of a particular entry. Apart from this, it also makes transferring contacts from one phone to another much easier. While the interface and app infrastructure of PureContact are not built to manage hundreds of contacts, they offer users a great deal of customization. This improves accessibility a great deal, which makes it a multifunctional speed dial app in a way. Through PureContact, you can send SMS, submit email, make calls and check messaging apps like WhatsApp. You will be able to keep in touch with everyone easily. With over 10 million users all over the globe, Contacts + has built a reputation of being among the best Android contacts apps. It is known for the efficiency and simplicity that it gives to your address book. It even helps integrate social media to your contacts list, making things more convenient for you. Not only will you be able to connect with your friends more easily, you may also block spammers and customize your address list. If your contacts are disorganized and you do not have the skill to solve that, FullContact may be able to help you. You will be able to fully import your contact list to the app, which is able to assist in weeding out duplicates. This will effectively streamline your address book. FullContact also enables you to tag and add notes to each contact. It also allows you to sync contacts from as much as 5 Gmail and iCloud accounts. 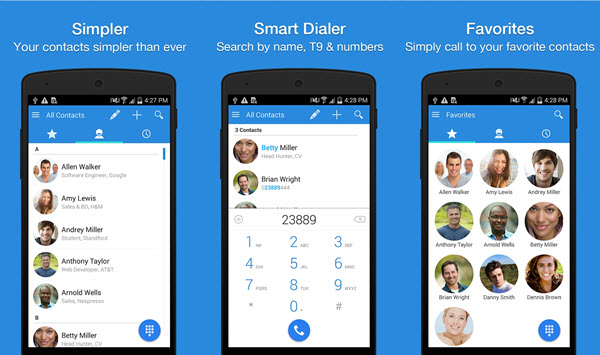 DW Contacts & Phone Dialer, as its name suggests, serves as both a phone dialer and a contact address book app. It helps you keep track of your contact history by displaying extensive lists of actions you did with a particular entry. 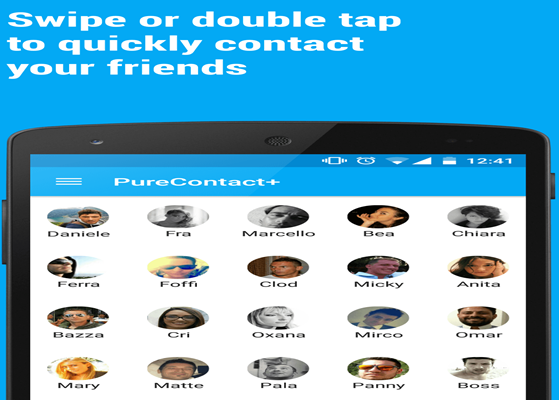 You can also group contacts and send mass messages easily. While it is designed mainly for business purposes, you can also use it for personal contacts. Some functions of Contacts Optimizer are paid but the most popular one like the Removal of Duplicates is available even for free users. 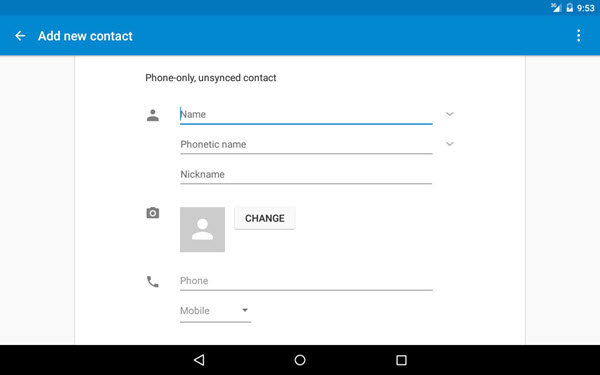 One of the best things about this free Android contacts app is the fact that it is easy to edit entries. It is also fairly easy to transfer individual contact entries between accounts. A quick delete function is also available for use. 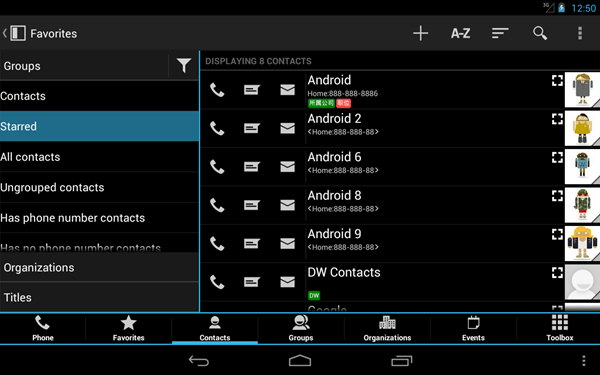 True Contacts is one of a few items on this list that fully integrates with the Android system. 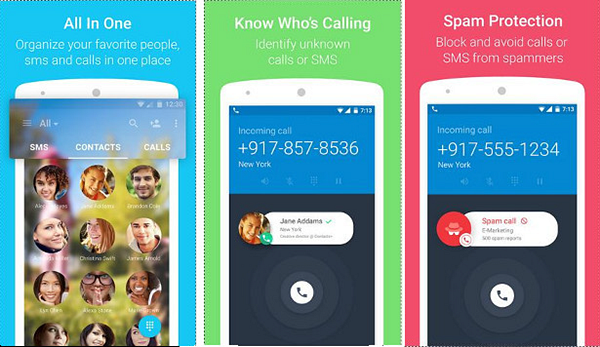 It is designed based on the Android source, which is why it will change the names of even your Google Hangouts friends to the names on your address book. It also syncs well with your Gmail contacts. Just make sure that you connect it to your Google account. Simplicity is one of the biggest advantages of Sync.Me. 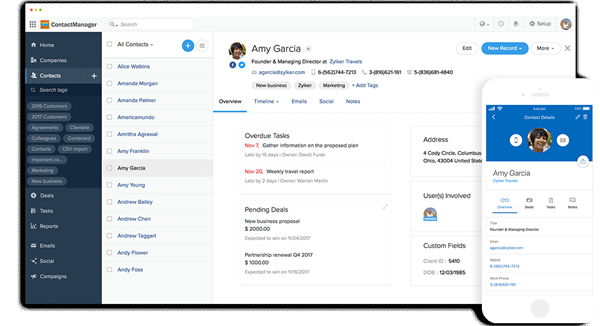 Contacts management is easier than ever as Sync.Me pulls information from most of your social media like Google, Facebook and LinkedIn. A few extra features like photo sharing and birthday reminders are also available for users. Plus, it has caller ID and text ID functionalities. 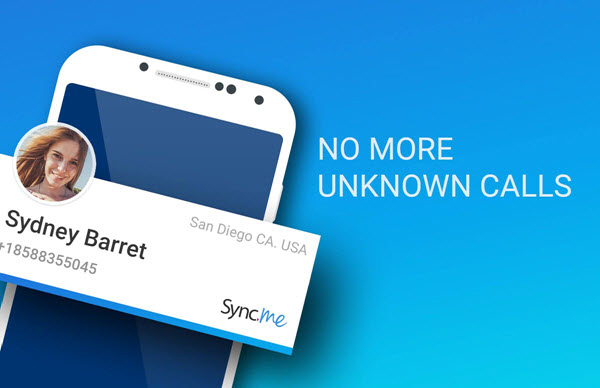 Just like Sync.Me, Contacts Ultra also pulls your contacts and connections from your social media accounts. The great thing about Contacts Ultra is that it allows you to mark specific contacts as coming from a particular account. Navigation in the app is also fairly easy. 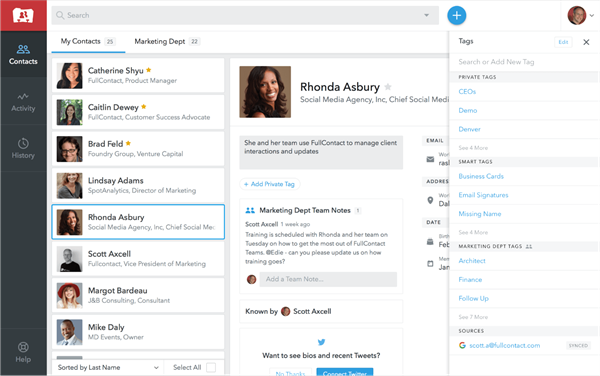 Simpler Contacts may not have the advanced feature of integrating with your social media accounts but it does result in a more focused address book. This will result in finding contacts more convenient and easier. Each of the items on this list has a set of strengths and weaknesses. But all of them help to make your contacts easier to go through and manage in some way. 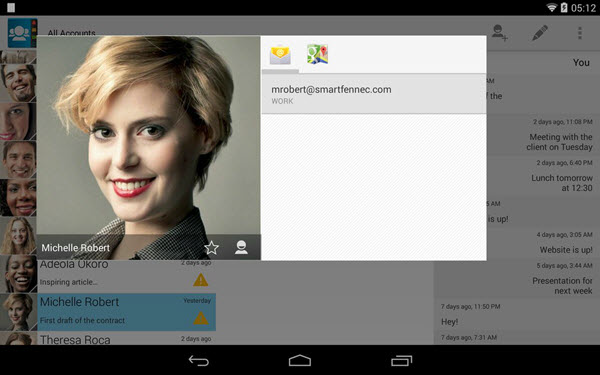 So you can choose the best Android contacts app depending on your needs.